Climaveneta is now the specialized brand for comfort and process applications while RC will be focused on the IT Cooling segment. Current market trends show increasingly complex and stringent regulations, higher competition, and growing technological specialization. 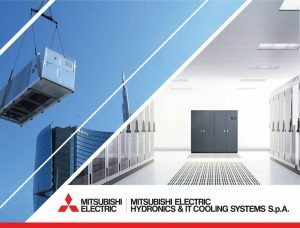 These factors have led Mitsubishi Electric Hydronics & IT Cooling Systems to strengthen its leadership and create better conditions for stable progressive growth, through a differentiated and specialized approach to the market. To harness the opportunities of the market and benefit from the synergies within the Mitsubishi Electric group in the most effective way, the Company’s new strategy is the specialization of its’ brands in segments. Thanks to the broad experience of the Climaveneta brand as a European leader in the HVAC industry, who has historically provided high performing, reliable, and eco-sustainable air conditioning and heating solutions for the most challenging and demanding projects worldwide, Mitsubishi Electric Hydronics & IT Cooling Systems S.p.A. has decided to turn Climaveneta into the Group’s specialized brand for comfort and process applications. On the other hand, the RC brand has been a major player widely recognized for its leadership in IT Cooling solutions, with over 50 years’ experience in the market. Building on this strong legacy, RC now will become the Group’s specialized brand for IT cooling, merging the experience of RC with Climaveneta’s in this segment. The result is a brand-new business organization providing the most complete product range, which combines the best technologies, solutions, and innovations of both brands, taking advantage of integrated R&D, operations, and central functions. Since Mostra Convegno is the most important HVAC+R and energy efficiency global event and showcases the most advanced technologies, solutions, and systems for smart buildings with a strong focus on comfort and energy efficiency, Mitsubishi Electric Hydronics & IT Cooling Systems S.p.A. will present the most innovative, performing and eco-friendly Climaveneta products for Comfort and RC energy efficient solutions for IT cooling applications. Specifically, in the area dedicated to Comfort, new Climaveneta products will be presented, including the latest solutions for residential comfort: the new i-BX-N heat pumps and the improved i-LIFE2 SLIM hydronic terminals. In line with Climaveneta’s strong focus on high efficiency and sustainability the Company will present the new i-NX-Q, from the INTEGRA family, is multi-purpose heat pump for the simultaneous production of cooling and heating and i-FX-HFO, a new chiller with the eco-friendly green refrigerant HFO. In addition, the new WIZARDX unit, which is linkable to Mr. Slim by Mitsubishi Electric and represents the upcoming synergies within the Mitsubishi Electric group, will be presented for the very first time in Milan. The area dedicated to the IT Cooling will contain all the newest solutions for data center cooling offered by the RC brand: the i-NR-FC-Z new liquid chiller with inverter technology and free cooling to maximize the energy efficiency of the data center, two different precision air conditioning solutions with a special focus on the NEXT X-TYPE unit that combines reliability and energy efficiency, granting a pPue lower that 1,07, in addition to a data center island. Also for the IT Cooling segment the first integrated solution will be presented, with RC HPAC units and MELCO Mr. Slim working together. A focus will also be dedicated to ClimaPRO, the optimization system, that through the integrated management of all system components, maximizes the energy efficiency of the system and maintains it with a predictive approach.